The statement in the photo is so true. I'm loving this book Craving Connection. I've craved connection my whole life! I know that I'm a little odd... peculiar?? geeky?? can't put a finger on it?? ;) That's ok. I've spent a lot of time wishing for friendships to happen, waiting for someone to PICK ME! Sometimes I cried so loud I couldn't hear God's voice beckoning me to let Him in. I've envied others friendships and even family relationships because I THOUGHT I never had super close girlfriends or close family ties, only to find out I DID, but they just looked different than anything I'd seen. Just because it was different, didn't mean it was done wrong or didn't exist, or didn't count as a friendship. It took me a while to get my eyes off of "poor little me" to see how rich the connections were that God placed around me! 1. Jesus first. Everything else will be ok if I get this one right. It takes me spending time with Him to see and feel Him at work IN me, AROUND me, and THROUGH me. Jesus and me is always enough. 2. My neighborhood is my mission field. I can pray WITH them or FOR them, but it takes me to get out of the door to get to know which it will be. 3. Be the friend you want to have. If I want a girlfriend who will go to lunch with me, then I'd better pick up the phone and call a few acquaintances! Likewise, if someone calls and asks me to meet them - I'd better say YES! Same thing for my long-distance friends (who have been through the wringer with me with all the moves). I've got to make those calls, send those cards of encouragement, and pray with them and for them. It's a 2-way street! 4. Friendship is like gardening. There are seasons of preparing, planting, and harvesting. It takes work. It can take years to see the fruit, but keep working on it and believe it will come! I recently planted lemon seeds from a lemon I had at my house. I had to learn how to prepare the seeds, before even putting them in dirt. It took time for me to let them rest in a warm environment for them to start sprouting, and it may be years before it's big enough to set a bloom, or grow a lemon. Still, it's worth it! I don't know what will happen in a few years, but today I'm nurturing those seedlings that have so much potential! Sometimes, all we can do is nurture the potential of a friendship. 5. Sometimes, God wants to nurture ME, and if I ignore Him, He will stop me in my tracks and MAKE ME be still. I spent all last fall, winter and spring sick. Seriously. From August through May I had a horrible cough, asthma, and was weak from being so sick all the time. We had just moved, and I couldn't go out and DO all the things I wanted to, or visit "old friends" who didn't live very far from me. But you know what? God had a plan, and His plan was for me to rest, get to know my neighbors, spend a LOT of time with Him. And it was good. VERY good. Don't ever discount time alone with the Lord. So sweet!! 6. Friendships have a natural season to them too. I've had friends that have spanned a few decades (wow, I'm old!) but it doesn't mean that we speak every day (or week, or even year!). It doesn't mean we love each other any less, but ... you know... life happens. When I see a familiar number show up, or her name on an envelope, I'm just as thrilled to hear from them as ever! It's as if time has stood still, and we pick up right where we left off! That's ok!! It's actually a great benefit of good friendships! 7. No matter what has happened in the past, my husband is a best friend. His priorities have changed as our kids have grown, and perhaps he's a little... tired... of working so hard?? So we have fun together, laugh, play backgammon, serve others, nurture "couple friendships" and make memories. I may still get a little jealous of his work schedule, or he may choose to take time with the grandkids, or someday he may want to golf or fish with the guys (things he rarely does now), and when that happens I'm not afraid to pray "Change me God, change my husband, or change the circumstances." Usually, God changes me first. Then everything else falls into place and we're good to go. God WANTS us to have healthy connections, with Him, friendships, and in community. This book has great ideas and questions to get that conversation going, whether you're reading it alone or with a group. 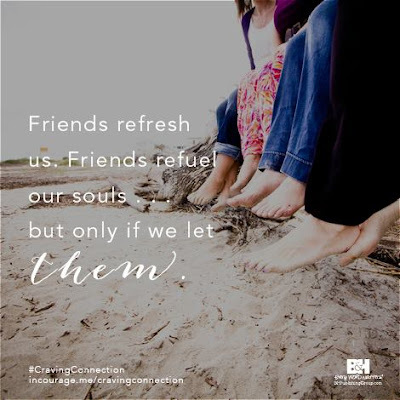 I'm praying that you'll discover the blessing of friendships, and growing new ones as well as nourishing the older friendships we have, and connecting deeper with Him through it all.